Would a ‘robo-boss’ be an upgrade for your manager? This is a scary thought for some, but perhaps a welcome thought for others. Although the article indicates that it is unlikely that robots could ever become managers, we can unpack the idea and look at the pros and the cons of this potential sci-fi future. Having a robot manager might appeal to those who think that they have a less than stellar boss. Would this leap perhaps spark hope of a “new and better day,” or could it prompt a greater appreciation of the fact that we are reporting to a person? What would life be like without having to worry about poor leadership? Robots could be fairer, have greater objectivity, and be devoid of any propensity to human bias. Think of what that could mean for productivity. Those provocative, yet sometimes “scary” lunches with the boss would become obsolete. These tête-à-têtes would be replaced by factual electronic reporting versus lengthy, opinion filled discussions and debates. But how would a robot show empathy to address any work-related concerns or conflicts among employees? Cold robotic reasoning may not interface well with the nuances of human judgment, compassion and concern. Employee engagement might be at an all-time low if they’re just being issued directives from a soulless machine. Words of encouragement or recognition delivered in a hollow monotone from a mechanical voice box would fall flat with listeners. For all the potential benefits of a Robo-boss, the human interaction and collegiality that one can experience with one’s boss would be missing, or in the least, hugely different. 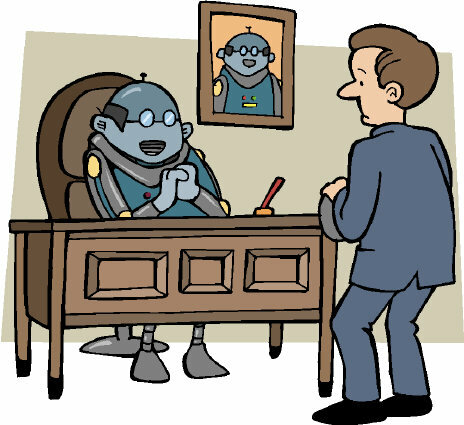 Further, one can imagine the diminished positive impact on mentoring and coaching by Robo-boss; how could a robot possibly provide guidance on the range of interpersonal skills requisite for success in the majority of roles? This would be a costly shortfall. The lack of human interface would be detrimental not only to the individual employee, and teams, but also to the organization that would run the risk of not fully developing its talent, as well as losing talent. In conclusion, perhaps your own experience or readings verify that “fit” with peers, co-workers and company culture are integral to an employee’s success and sustainability in a position. How would one define “fit” for a Robo-boss? And also, how would one define “fit” for an employee interfacing with their Robo-boss? Ironically, despite the “technical skills” offered by the robot, just like a human at times, the robot would be limited in its ability to display effective interpersonal skills. Nobody wants to work for a “bad boss” – robots included. How could LivingSocial's failure do more good than harm?